Goal of the Membrane Trafficking in Immune Cells Lab is to understand and ultimately tailor membrane trafficking pathways in immune cells. Our foci are the cellular processes that lead to uptake and degradation of foreign antigen and the trafficking cascades that lead to antigen presentation and cytokine release by dendritic cells. This section provides an overview of our techniques and research interests and lists some projects in our lab. However, our research interests are constantly evolving and this list will never be completely up-to-date. Transmission electron microscopy image of a dendritic cell. The yellow arrow indicates a potential intracellular route followed by a secretory granule. 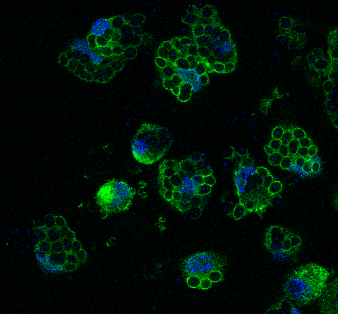 Fluorescence microscopy image of dendritic cells labeled for membrane trafficking proteins. Dendritic cells are white blood cells of the immune system. Dendritic cells circulate our blood and peripheral tissues where they sample for foreign antigens (e.g. microbial pathogens and cancer cells). The encounter of foreign antigen can lead to the activation of dendritic cells, which is accomplished by the marked production of many pro- and / or anti-inflammatory cytokines. Activated dendritic cells can migrate to lymph nodes where they present small fragments from the foreign antigen to naive killer as well as helper T cells. This activates these naive T cells, and thereby initiates an innate immune response. Dendritic cells are widely considered to constitute the link between adaptive and innate immunology, as they are the only cells that can activate naive CD8+ T cells in lymph nodes. To achieve our goals we develop new strategies that allow following the intracellular trafficking cascades in immune cells. We primarily study immune cells isolated from human blood and from mice. Our lab uses an interdisciplinary approach, combining conventional cell biological, immunological and biochemical methods with advanced fluorescence microscopy techniques such as fluorescence lifetime imaging microscopy (FLIM) and total internal resonance fluorescence (TIRF) microscopy. Time-lapse confocal imaging of a dendritic cell from the immune system phagocytosing numerous yeast cells (zymosan particles). The dendritic cell is purified from human blood, and recombinantly expressing the SNARE protein VAMP3 fused to mCherry. We primarily work with dendritic cells isolated from blood of healthy volunteers. We also study dendritic cells derived from mouse bone marrow. We combine classical biochemical and cell biological approaches with advanced fluorescence microscopy, such as fluorescence lifetime imaging microscopy (FLIM) and total internal resonance fluorescence (TIRF) microscopy. Dendritic cells activate native T cells by means of a tight cell-cell contact interface called the immunological synapse. From both the T cells and the DCs, membrane vesicles containing surface receptors and cytokines are locally released at this synapse. Whereas the molecular mechanisms underlying this process are increasingly well understood in T cells, this is still much less clear for the dendritic cell side of the synapse. In our lab, we study the molecular mechanisms of cytoskeletal organization and membrane release at the immunological synapse. Confocal 3d stack of immunological synapses between two T cells (red) and a single dendritic cell (green). Membrane secretion by mammalian cells occurs not randomly at the plasma membrane but at designated release sites. These sites are enriched in the membrane protein machinery needed for the secretion process. Interestingly, trafficking proteins with closely homologous functions and structures locate to distinct non-overlapping membrane domains. This plays a role for the secretion of different types of cargoes and in cell polarity. 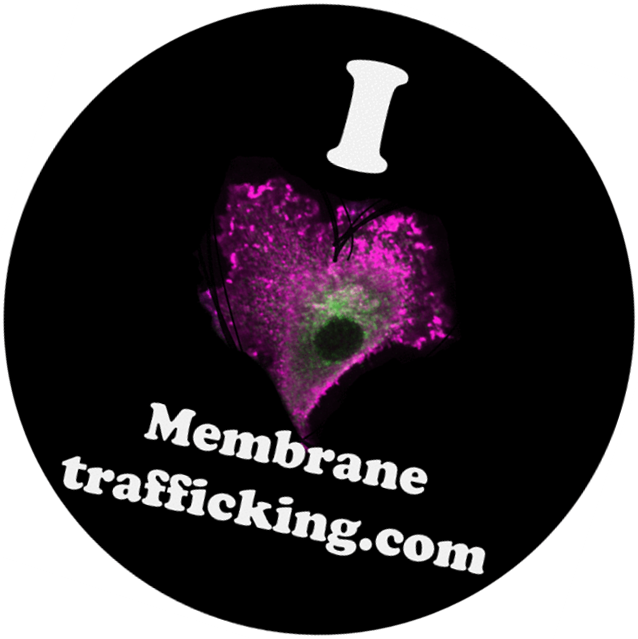 The spatial segregation of trafficking proteins to different membrane domains also plays a role for the sorting of cargo in intracellular organelles, such as the budding of trafficking vesicles from the Golgi apparatus or recycling endosomes. Our goal is to elucidate the mechanisms of membrane protein sorting, segregation and clustering in the plasma membranes and in internal trafficking organelles. We focus on the hydrophobic interactions between proteins with the plasma membrane and on lipid modifications of proteins such as palmitoylation. 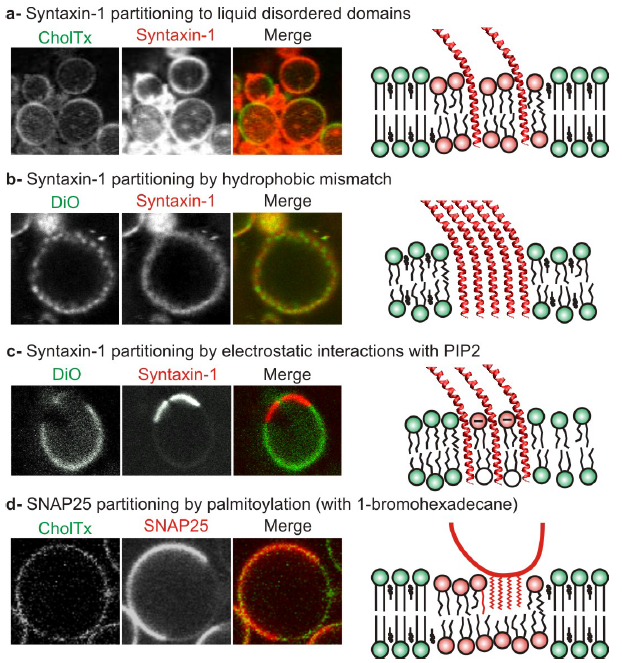 Confocal image showing lateral sorting of trafficking proteins in artificial giant membranes vesicles. Dendritic cells sample our blood and peripheral tissues for foreign antigen, such as death (tumor) cells and microbial pathogens. These antigens are recognized by receptors on the surface of the dendritic cells that recognize conserved molecular structures of microbes such as the cell wall components of fungi and bacteria. Death human cells can also be recognized by the presence of molecules typically not present on the surface of the cell. Antigen recognition can lead to activation of the dendritic cells that can also ingest the antigen by phagocytosis. Ingested antigen is broken down in the phagosomal compartments by metabolic enzymes resulting in peptide fragments that can be presented to T cells. This processing of the antigen is a tightly regulated process, and different types of antigens (bacteria, fungi) are processed in different ways. We study how the recognition of antigen leads to differential processing of antigen. We are particularly interested in the role of enzymatically generated reactive oxygen species (ROS) in this process. These ROS modulate the protein and lipid environment in the phagosomes and thereby affect the processing of the antigen. 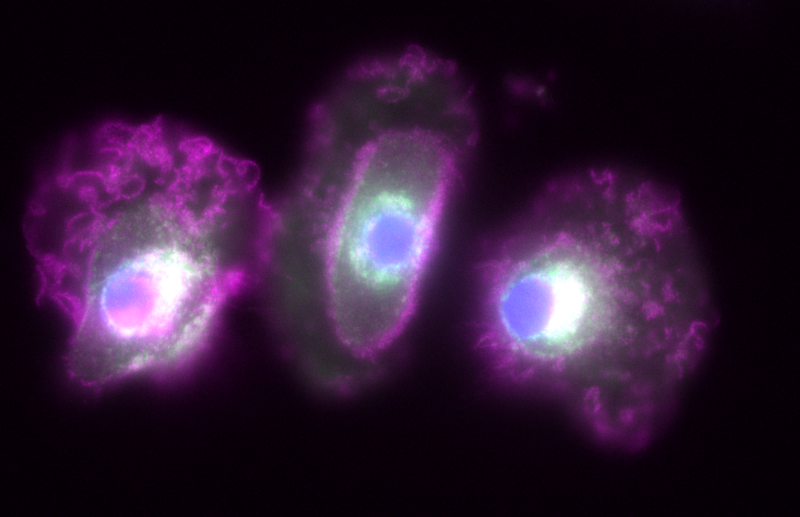 Fluorescenc microscopy image of dendritic cells with ingested stained yeast particles in phagosomes. Green: trafficking protein locating to the ingested yeast cells. Blue: Nuclei of the dendritic cells.